The term «Mediterranean Diet» is based on nutritional habits and traditions in Crete and South Italy in the 1960s. This dietary model made Greece famous and led all the scientists worldwide to show an interest to the «Cretan phenomenon» thanks to the longevity of its population as well as to the peoples of the Mediterranean. Following a Mediterranean Diet can provide the human body with all the nutritional values required, promoting, thus, health and well being. Mediterranean Diet is schematically represented in the form of a pyramid in order to define, for each category of food, the quantity required to be consumed on a monthly, weekly and daily basis. At the bottom of the pyramid there are food categories that should be consumed on a daily basis and in significant quantities, whereas at the top of the pyramid we can find categories of food that should be consumed less frequently and in low quantities. The pyramid highlights the frequency of consumption of the food categories and not their accurate quantities in grams. Based on research data, the adoption of the nutritional guidelines depicted in the pyramid of the Greek - Mediterranean diet results in the reduction of the risk of diseases directly linked to nutrition, such as cardiovascular diseases, obesity, type B diabetes, etc. The Greek - Mediterranean diet is full in nutritional ingredients and covers the needs of people at all ages. The basic principal of the Greek - Mediterranean diet is the triptych: Balance – Measure – Variety. 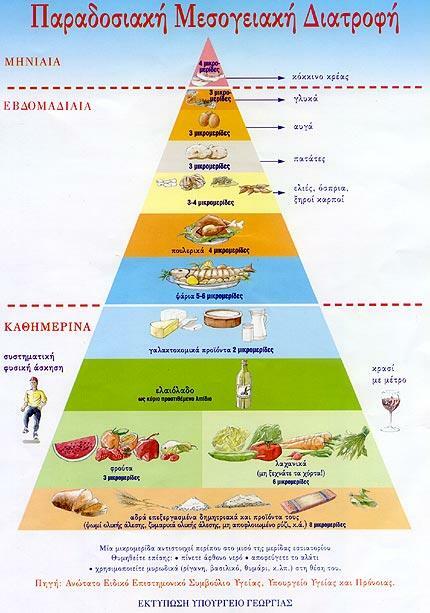 The Mediterranean Diet pyramid is divided in three levels, on the basis of the frequency of consumption of the food presented (on a monthly, weekly and daily basis). The main characteristics are that it is rich in fruit, vegetables and slightly processed cereals (whole grain). It includes the daily consumption of dairy products and the use of olive oil as the main fat of the diet. In addition, the pyramid includes the consumption of fish, poultry and pulses on a weekly basis, whereas it suggests limited consumption of red meat (Table 1). The bottom of the pyramid consists of food such as cereals and their products (bread, pasta, rice, etc), that need to be consumed on a daily basis since they provide us with energy through their content in carbohydrates. This food is low in fat and when it is whole grain, it also provides us with several vegetable fibers which are contributing to the best function of the bowel and the decrease of cholesterol. The group of fruit and vegetables. Due to their high content in vegetable fibers, vegetables decrease fat absorption and regulate weight at normal levels. This is due to the fact that they increase saturation and satisfy the feeling of hunger quite quickly; as a result, normal quantities of food, salty or sweet, are consumed. Furthermore, they contribute to the good function of the bowel. What is more, vegetables, thanks to their high content in water, enhance the hydration of the body. Vegetables have a low calorific value and are fat and cholesterol free. Fruit and vegetables contain nutrients and phytochemicals and are believed to protect cells from damage from cancer. They contain vegetable fibers, vitamins such as vitamins C, E and folic acid, metals such as selenium, and phytochemicals such as carotenoids, flavonoids and isoflavonoids. Fruit and vegetables can reduce cancer risk thanks to their antioxidant or anti-inflammatory effect, enhancing the metabolism and the secretion of carcinogenic substances, supporting the immunity system and changing the numerous cellular systems that shall finally define cellular populations. More specifically, those vegetables used most in the Mediterranean and Greek traditional cuisine, as much raw as cooked, are onions and tomatoes. Apart from the fact that onions give food a special taste, they have a special nutritive value. More precisely, onions have zero calories and do not contain salt, cholesterol and fat. On the contrary, they are rich in phytochemicals known as disulfides and trisulfides, which are responsible for their characteristic smell and for their antimicrobial and anticancer properties. Furthermore, they contain flavonoids and most especially quercetin and have a strong antioxidant action, while they offer vitamins B6 and C to the body, as well as vegetable fibers, potassium, calcium, manganese, chromium and folic acid. As a result, onions contribute to the prevention of cardiovascular diseases since they help to control blood sugar, cholesterol and triglycerides. As for tomato, it is an important food ingredient since the antioxidant lycopene it contains is better absorbed by the body when heated, so, it is more easily released by the cellular walls of tomatoes. Lycopene, contained in tomatoes, is one of the strongest antioxidant substances thanks to its capacity to eliminate the harmful effects of oxygen-free radicals causing the DNA cells to mutate. Furthermore, tomatoes reduce prostate cancer risk up to 45%. The frequent consumption of tomato (always in season), enhances prevention from strokes thanks to its rich content in potassium, which regulates blood pressure. Okras (lady’s fingers): They are an excellent source of vegetable fibers and antioxidant substances such as b-carotene, vitamin C, lutein and zeaxanthin. As a result, they enhance vision as well as the immunity system. Young okras are particularly efficient in case of constipation since they have a high content in vegetable fibers. Peas: They contain compound carbohydrates releasing energy directly to the body. Ideal food for people with high blood pressure since it is rich in potassium. Peas are our allies against increased levels of cholesterol since it has a high content in vegetable sterols. Green beans: Their main characteristic is their high content in vegetable fibers which help relieve constipation, reduce blood cholesterol and the absorption of fatty acids. Regular consumption of peas contributes to the prevention of cancer of the large intestine, protects from cardiovascular diseases and regulates the body weight efficiently. Green beans contain vitamins C, Κ and folic acid and as a result, they increase the blood coagulation capacity and the absorption of iron. Artichokes a la polita (artichoke hearts in lemon sauce): They are characterized by their high content in silymari which is antioxidant and fights against free radicals in the body; as a result, they protect from various forms of cancer (skin, biliary duct, prostate, liver, etc). Cynarin is one more important ingredient contained in the artichokes; it stimulates both the production and secretion of biliary fluids improving the symptoms of gastrointestinal problems such as ventricular pain, nausea, diarrhea or constipation. Pulses play a major role in the Mediterranean Diet as they constitute an excellent food for people, dense in nutrients and rich in vegetable fibers and proteins. Proteins contained in pulses, although lower in biological value compared to the meat proteins, they are much superior compared to other vegetables. Pulses also contain slow absorption carbohydrates and as a consequence they are considered to be an excellent choice even for diabetics. Apart from all the above, pulses are also rich in vitamins Β and Ε, in iron, phosphate, sodium, potassium and calcium salts, as well as in vegetable fibers. The big quantity of pulses and their insurmountable quality in vegetable fibers not only help in the good function of the bowel, but also in the reduction of cholesterol levels, prevention of cardiovascular diseases and of many forms of cancer. Another main ingredient in the Mediterranean Diet is olive oil. Numerous studies have shown that olive oil, which is rich in monounsaturated fatty acids and antioxidants, protects from coronary disease, reduces the levels of “bad” cholesterol and at the same time, it increases the levels of “good” cholesterol. Dairy products are a source of inorganic elements and vitamins -calcium being mostly known- as well as of high nutritional value proteins. Calcium is necessary not only for strong bones as the body develops but also for the conservation of the bone mass during adult life. Furthermore, Mediterranean Diet is characterized by the regular consumption of fish. Main examples of fish consumed in the Greek Cuisine are gilthead sea bream and sea bass, distinguished for the high content in selenium, phosphate, vitamin D and ω-3 fat (EPA, DHA). As a consequence, they contribute to healthy bones and vision and they offer unique anti-inflammatory and antioxidant protection for the heart and the vessels. In addition, poultry occupy an important position in the diet pyramid since they offer our body high nutritive value proteins and iron which is easily absorbable by the body, as well as significant quantities of vitamins B enhancing the nervous system. It is recommended to consume fish and poultry 2 to 4 times a week. More rarely, should we consume red meat (few times in a month). It contains high nutritional value proteins, iron which is very well absorbable by our body, zinc and important vitamins. However, at the same time, it contains saturated fatty acids with negative effects to our health. Finally, red wine, when consumed with measure (1-2 glasses per day) is beneficial to the cardiovascular system and helps in the conservation of “good” cholesterol (HDL) and in the elasticity of the endothelium thanks to the flavonoids it contains. Mediterranean Diet is mainly characterized by the abundant consumption of food with natural origin, enduring that all needs in basic nutritional elements, metals and vitamins are covered. It is important for every main and intermediate meal to contain the food suggested by the Mediterranean Diet Pyramid so that our daily diet may be nutritionally complete and balanced.